A positive sloped ramp gives you a low to high frequency sweep and a negative sloped ramp gives you high to low frequency sweep. The sweep speed of the chirp is set by the rate of the slope. The frequency range of the sweep is set by the FM deviation setting on the MXG. You can see the function generator outputs on the scope screen in the image. The start of the pulse modulation on the MXG (bottom left) is controlled by the rising edge of the pulse waveform from channel 1 of the 33522A. If you notice in the image, the ramp waveform is already approximately halfway through its ramp up cycle by the time the pulse is triggered. This was done intentionally in fact you can control where the carrier sweep starts and stops inside the pulse by adjust the phase of the ramp in relation to the pulse output. 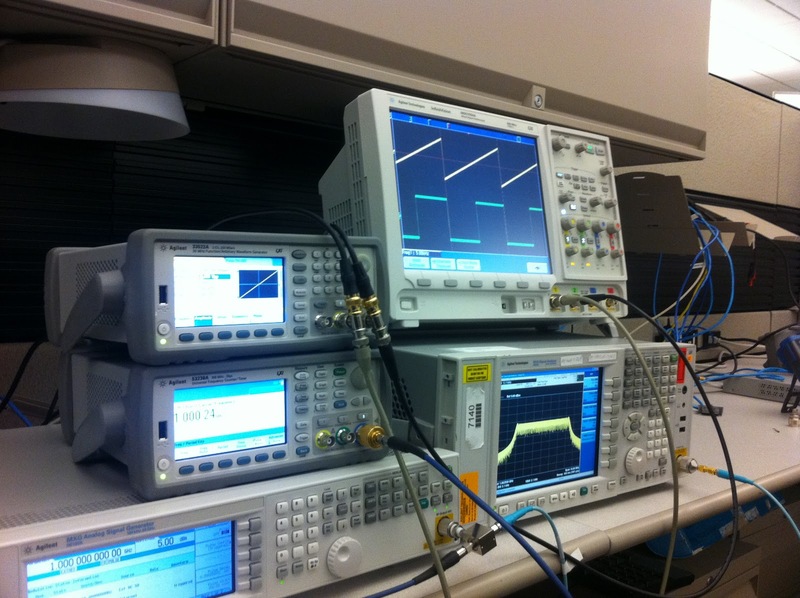 On the bottom right, the N9020A MXA signal analyzer shows the resulting chirped RF pulse in the frequency domain. Below the 33522A in the image, the 53230A universal counter's microwave channel is also being used to measure the pulse characteristics including: pulse width, pulse repetition rate, and carrier frequency. The analog signal generator and 2-channel function generator method for creating chirped RF pulse signals filled my testing needs and was much lower cost then turning to a vector signal generator. When designing a device with max power point tracking (MPPT) capability such as a solar inverter, micro inverter, or power optimizer you are going to need to simulate the output of a PV panel or panels to test your MPPT design. This is necessary to verify your design and provide an accurate efficiency spec under a wide variety of weather patterns (I-V curves). Now a lot of engineer new to this type of testing decide to take a standard programmable power supply, connect it remotely to a computer (using GPIB, LAN, USB, etc), and create software with adjustable I-V curve look-up tables with the idea of turning their power supply into a PV panel simulator. This whole concept is shown in the figure (click to enlarge). The IO latency between the computer and the power supply. The supply programming time which consists of the time it takes the supply to process a command and the time for the internal analog circuitry to move the output of the supply to where it should be on the curve. The most limiting factor is that this is a closed loop system, which leads to oscillations in the output. Now to get rid of oscillations digital filtering will need to be added to the software which leads to multiple iterations of back and forth adjustments between the computer and supply to zero in on that point on the I-V curve where the supply output should be. Because of the overhead just discussed you cannot achieve output bandwidths better than 1 Hz using this solution to simulate the output of a PV panel. For this reason it is not an acceptable test method to verify your MPPT design or spec the efficiency of your MPPT design. Now does this PV simulation method have a place in the MPPT hardware test cycle? Because of its relative low cost it could be used in long term reliability testing where you are just interested in continually feeding power through your design over a long period of time to make sure it doesn't break down. As a fun project I recently created a Matlab program that allows you to use a 2 channel arb and a scope in XY mode as a electronic message board. Below is a link to download the Matlab files if you would like to try it out. It is a great way to display away messages when you are not at your desk / lab station or to show school pride or to brag about your favorite team’s performance. 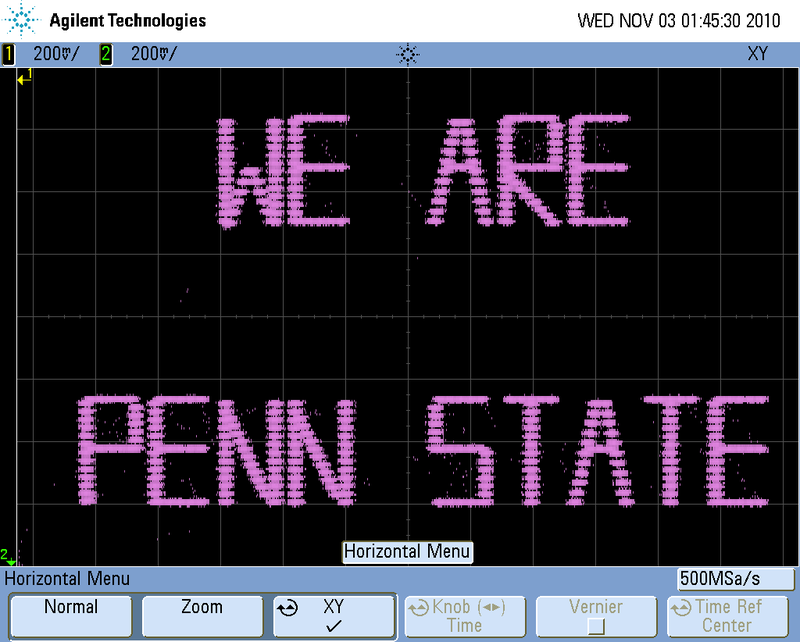 The included figure (click to enlarge) shows my school pride displayed on a scope using an electronic message created with the XY_Text_Writer program. 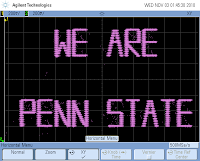 The program works by inputting a message (up to 26 characters including spaces). It takes the message and generates XY amplitudes corresponding to points in vectors. The vectors are moved around and mathematically manipulated to form each character. Using those amplitude vectors it generates an X and Y waveform. The program uses the LAN connection to download and output the waveforms from the 33522A. With the scope in XY mode the two waveforms coming out of channel 1 and 2 of the 33522A are converted to electronic messages on the scope display. In the "XY_Text_Writer.m" file comment out the "vec2arbstring()" functions and the "arbs_2_33522A()" function. Then use the following function to generate a .csv in your current directory: dlmwrite(csv_name, z', 'coffset', 0, 'roffset', 0). Notice the 'z' matrix is transposed. From there you just have to load the waveform from the .csv file to your two channel arb. Set the output Z of the arb to match the input Z of the scope. Start the output amplitude at about 5Vpp for each arb channel and adjust as needed. Set the arb to run at a sample rate of 300 to 400 KSamples/s.